A road tip to Ladakh is best advised by your own vehicle. This is beneficial in numerous ways and allows you to explore much more in limited time. With that being said, bringing their own vehicle for the trip is not always a choice for everyone. Some people do not feel confident enough to drive themselves while others are a bit short on time. A lot of people live a bit too far away to be driving all the way from their home. The next best thing to do then is to catch a flight to Ladakh and rent a taxi there for local sightseeing. If you too were planning on doing the same then mentioned below are the Ladakh taxi rates 2019 which can help you determining the overall cost of doing so and planning your budget. There is a slight increase in taxi rates on all routes as compared to previous year but that usually is the case each year. Tourism in Ladakh is on rise and tourist footfall increases every season. With the increasing number of people visiting here, the demand of taxis too has gone up. And an increase in demand is always followed by increased cost which is the case with Ladakh these days. Should you book a taxi in advance? I would say that yes you should. Last year, during peak tourist season, people found it hard to find a taxi because everyone they called was booked already. If you were planning to visit in the months of June till September, I would highly recommend that you book a cab ahead of your visit. Is booking a taxi in Ladakh going to be easy on your pocket? Well not really unless you were traveling in a group. Taxi rates in Ladakh are a costly affair but it does have its own benefits as well. If you weren’t sure whether or not you should rent a cab there, then please read Why you should rent a taxi in Ladakh. Maybe the information posted here can help you make a final call. Now coming to the topic of taxi rates, there are cars available for rent in Ladakh. 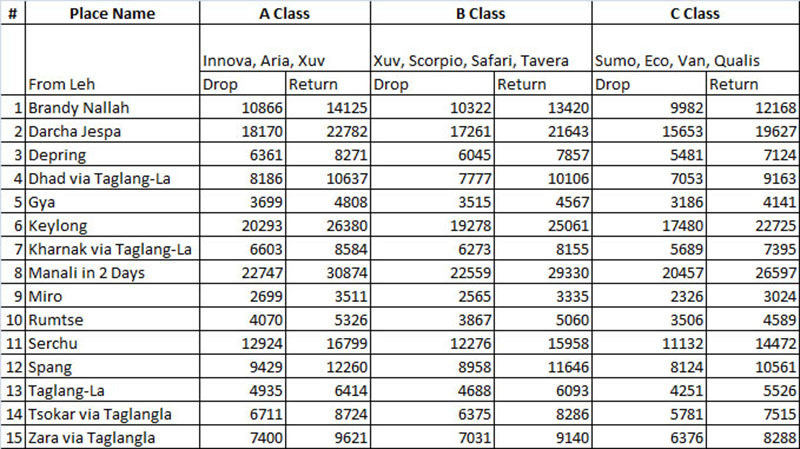 Type A of the cabs is the most expensive one followed by B and C class. There is also the choice of hiring a tempo traveler or a Maxi cab if you were traveling in a large group; rates of which I will share in a following article. Let me first post some of the most common routes used by tourists and taxi rates on these routes. After this, I will then break it down and provide information based on different parts of Ladakh. Along with the taxi rates, I am also posting information on how much it will cost you in a tempo traveler; in case you were traveling in a larger group. For more details on tempo travellers, read Ladakh Tempo Traveller Rate List. For the sake of explaining this better, I will break the information down in different regions of Ladakh. I will begin with your arrival in Leh city. If you want to book a cab to pick you from the airport and drop at the hotel, then below is how much it is going to cost you. Depending on how far your hotel is, a taxi from Leh airport to Leh city will cost you between Rs. 550 to Rs. 1,500. As you can see in the chart above, the charges of A and B Class taxis are exactly the same. There is a small difference in the rates of C Class cabs but it is not too significant. Choglamsar Bridge is about 9 kilometers from the airport and Stok Palace is about 15 kilometers. Next let us talk about the fare that you will be paying if you rent a cab for sightseeing in and around Leh City. The three places that I have highlighted in the chart below are probably the most relevant ones for majority of the tourists. 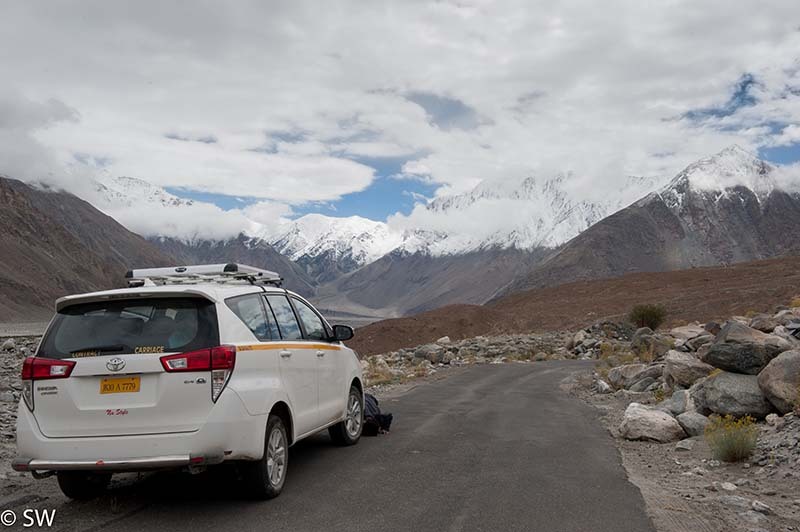 If you rent a taxi for Khardung La, then it of course cannot be just a drop because you will also be using the same cab to return. That is the reason why it shows Rs. 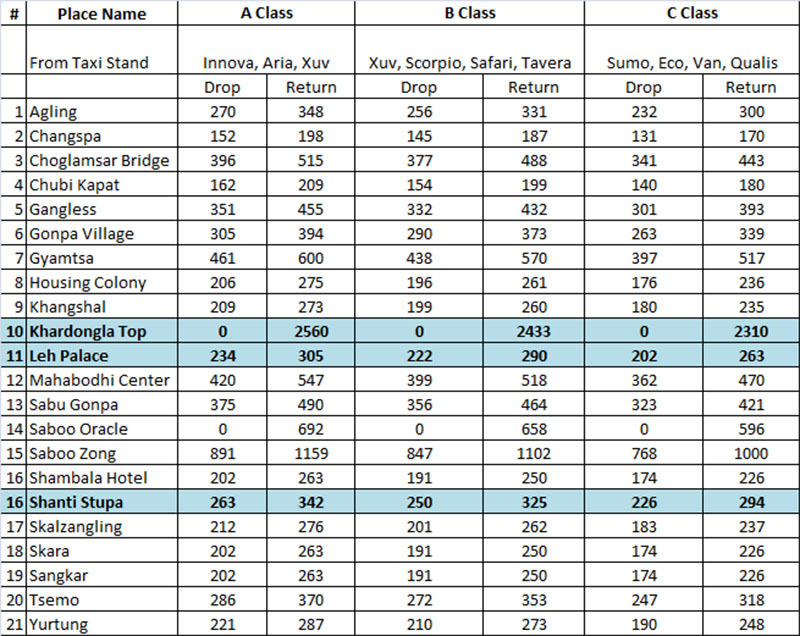 0 in the drop field. Depending on what type of cab you chose, a drive from Leh to Khardung La and back will cost you between Rs. 2,300 to Rs. 2,600. Depending on which cab you chose, a taxi from your hotel to Leh Palace (drop and return) will cost you between Rs. 200 to Rs. 300. Leh Palace and Shanti Stupa are in fact located quiet close so you can actually rent the same cab for both the places. But a cab just for Shanti Stupa will cost you beteen Rs. 200 to Rs. 350. Next let me provide information on how much a taxi will cost you from Leh to Nubra Valley. You can refer to the chart below to determine the taxi rate for a respective place; but the part highlighted in blue is the most relevant one for tourists in my opinion. Depending on the type of cab you chose and destination you opt for, a cab from Leh to Nubra valley and return in 2 days will cost you Rs. 10 – 12k for Diskit and Hunder. If you go as far as Turtuk then this fare would increase to Rs. 12 to 14k. If you also include Panamik and make it a 3 days trip, then the fare would be between Rs. 18k to 21k. Please refer to the rates below for more information. Depending on the type of cab you chose, a taxi from Leh to Pangong Tso and return in 2 days will cost you between Rs. 9k to Rs. 11k. If you want to continue traveling and explore even further, then a round trip to Chushul will cost Rs. 13,000 for one day; and Rs. 16,000 for two days (for A Class cabs). Venturing further into Chumathang Valley; a private taxi to Hanle will cost about Rs. 17,000 round trip. If you want to complete the Pangong – Chushul – Tso Moriri – Leh circuit then a three day trip on this route will cost you about Rs. 24,000. Please refer to the chart below for more information on the taxi rates. The ones highlighted in blue in my opinions are the most relevant ones for tourists. A one day taxi from Leh to Tso Moriri and return will cost you Rs. 12,000. If you extend the journey for 2 days and return the next day, then it will cost you about Rs. 15,000. 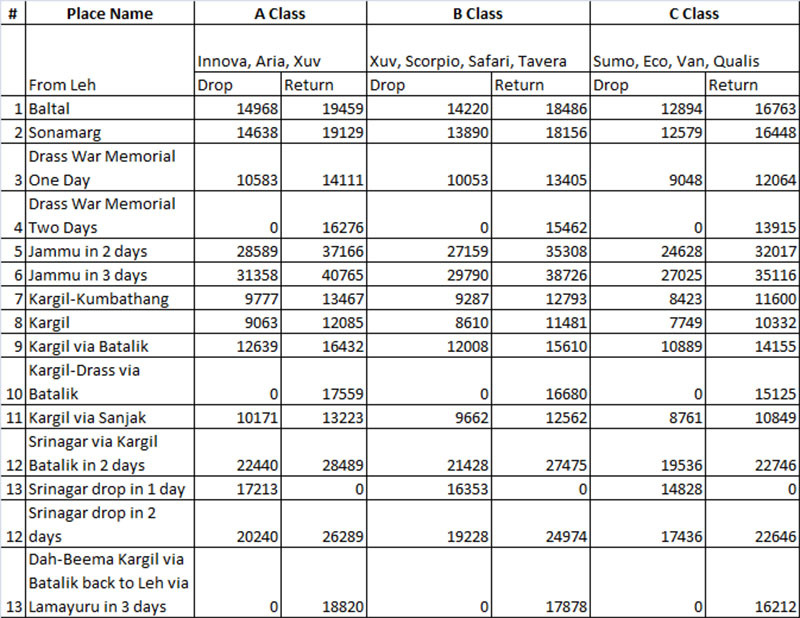 Please refer to the chart below detailing fares depending on various ways that this journey can be done. 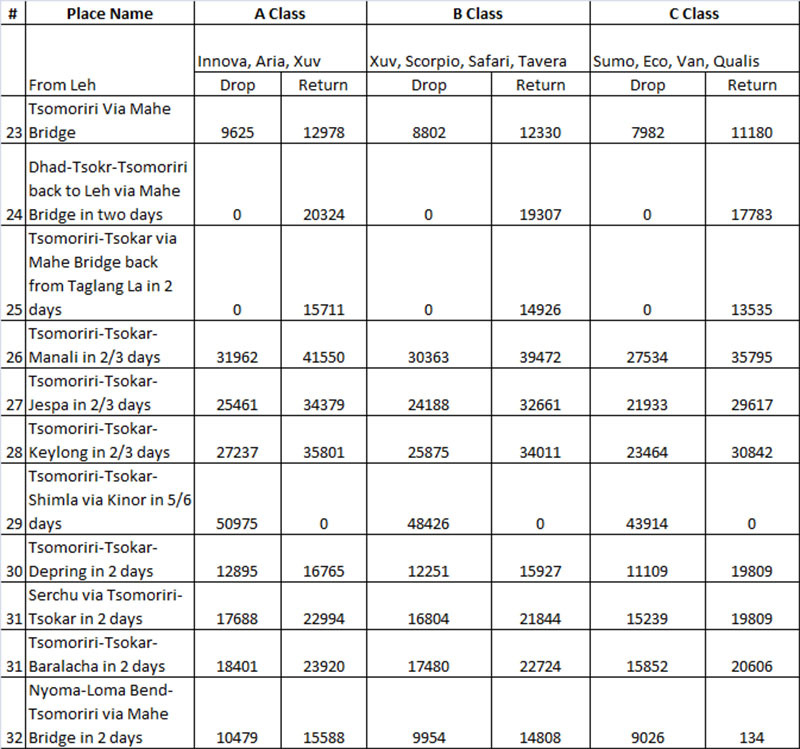 Below is a chart detailing fares on Leh to Srinagar route. A private taxi from Leh to Kargil will cost you Rs. 9000 for drop and Rs. 12,000 for return journey via Lamayuru. If you however went via Batalik route then the charges will be Rs. 12,600 for drop and Rs. 16,400 for a return journey. A private taxi from Leh to Srinagar will cost you Rs. 17000 for a single day journey. If you want to break the journey in 2 days with a night halt at Kargil then it will cost you Rs. 20,000. For a return journey to Leh, it will cost you Rs. 26,000. A private taxi dropping you from Leh to Jammu will cost you Rs. 28,500 for 2 days journey and Rs. 31,300 for 3 days journey. For a return journey to Leh, charges will be Rs. 37,000 for 2 days and Rs. 40,700 for 3 days. A private taxi from Leh to Drass will cost you about Rs. 12,000 for a drop and Rs. 16,000 for return journey. 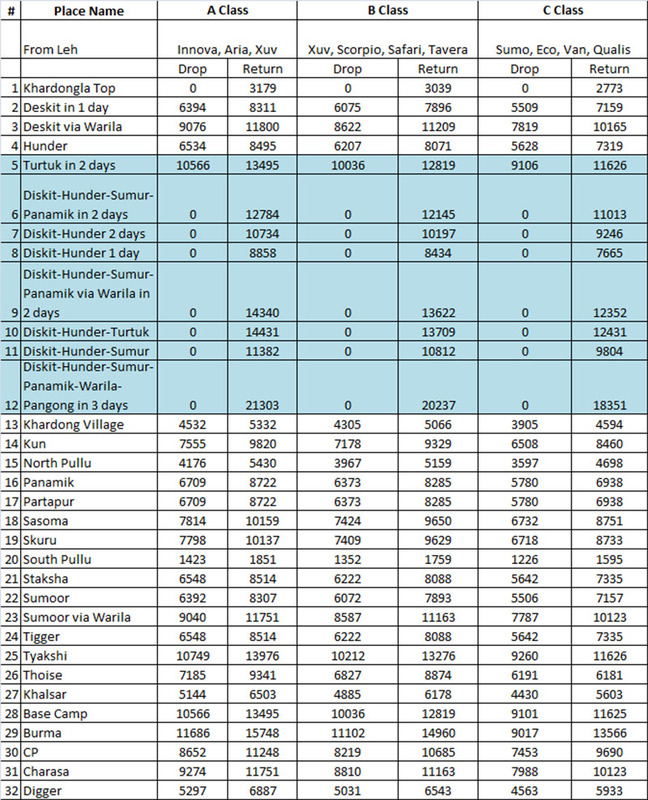 Below is a chart detailing taxi fare on Leh to Manali route in 2019. For a 2 days journey, a cab from Leh to Manali will cost Rs. 22,000 for drop and Rs. 30,000 for return journey. If you just want to visit Tso Kar lake on Manali Leh highway, then a private taxi will cost about Rs. 8000 for return journey and Rs. 6000 for drop. 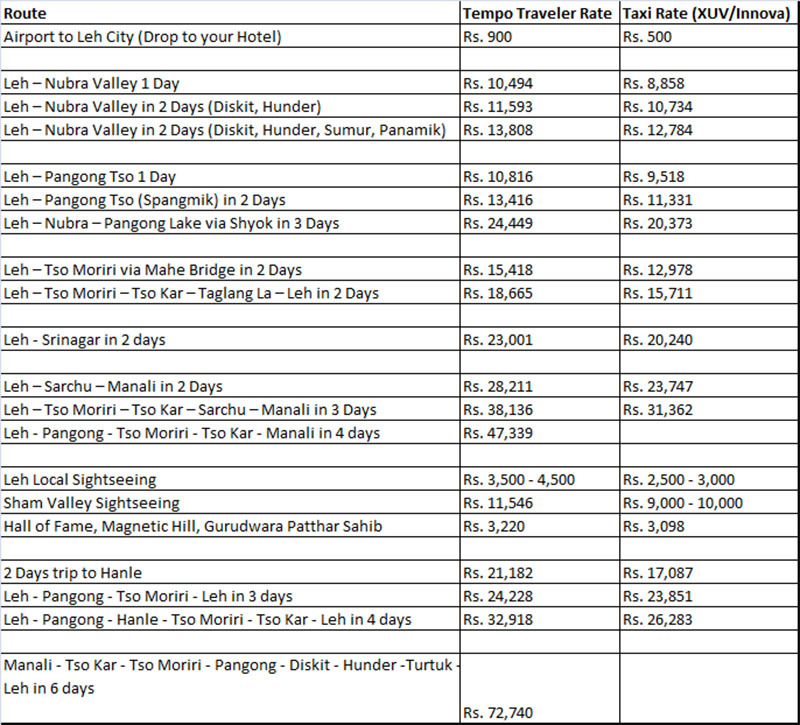 Below is a rate list showing how much a private taxi from Leh will cost you on the Sham Valley route. I have mentioned the rates for all the places but the ones highlighted on the top will be the most relevant ones for tourists. 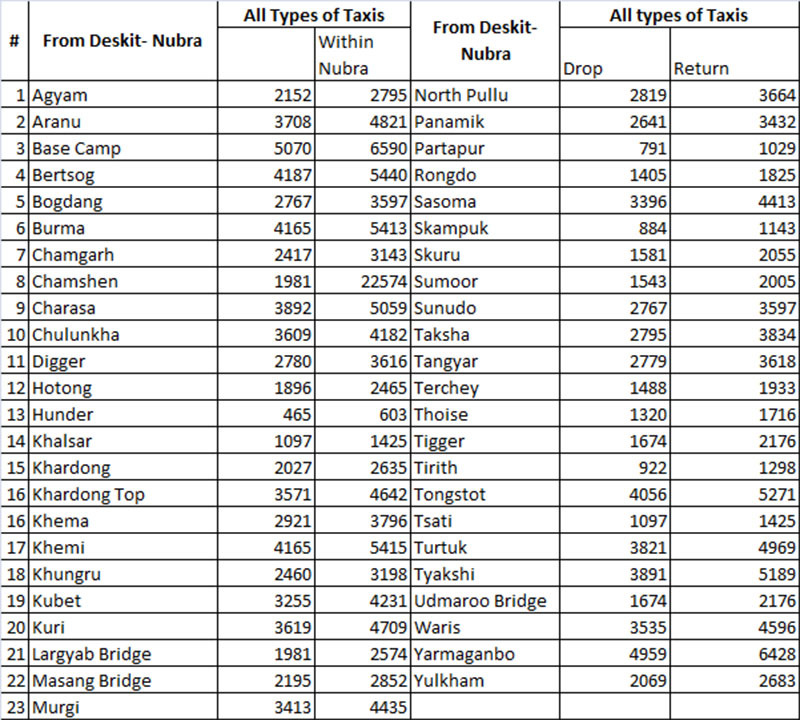 Below are the taxi fares for some other routes in Ladakh. Below are the taxi rates if you hire a private taxi in Nubra Valley itself. These rates are for taxis available from Diskit for visiting other places in Nubra Valley. If the taxi is used for more than specified days to the destination will be charged for the category as detailed below. Waiting charge fir the first hour will be free and remaining hours @ Rs. 314 per hour for all type of vehicles. Extra entry into routes from the planned routes is chargeable upto 8 Kms@ Rs. 314. The rates has been prepared for the year 2019-20, applicable from 1st April 2019. 50% of the billed amount should be deposited in advance in long routes Like- Manali, Srinagar others routes of Leh district. Night halt charges @ Rs. 350/- for all types of vehicles. I hope the information above on taxi rates in Ladakh in 2019 was of help. If you have any questions; or need any further information; please feel free to ask in the comments section below; or at our Community Forum; and I will be glad to answer. Always nice to read your blogs which gives a good insight of Leh- Ladakh. I’m planning a trip to Leh Ladakh as under, How much would a taxi cost me for below itinerary dates if I can contact the taxi owner directly instead of going through any travel agents. 12) June 4 – Sonmarg/Srinagar to Srinagar Airport Drop. We shall be 3 persons OR maybe 6 persons travelling together. Hi Niren – Please contact Nasir in Leh @ 9906229203 and he will be able to give you a cost estimate better. Hi, Mr Vargis Khan. Good morning. I find your blog very informative and useful. We are 9/10 heads will be going to ladakh in end August/September ’19 for 12nights, 13 days tour starting from Srinagar airport to Manali through Kargil-Lamayuru-leh-Turtuk-Hundar-pangong-Hanle-Tsomoriri-Keylong-Manali. Can you please suggest what type of transpor we could avail? An what can be the approximate total cost? It is doable Sanjeev but entirely depends on how well can you handle the bike. There is a lot of snow on the road towards the top of the pass so it will be a very challenging task. I know people who have done it but it won’t be an easy thing to do. We r planning to ride in july in ladakh from Chandigarh.. 14 riders are in group..
What you suggest to overcome this issue.. thanks in advance..
Talk to Nasir in Leh at 9906229203. He run his own taxi there and you can book him. He can also advise about the hotels there at all other places. In July 2019 we are planning for Ladakh trip. We are taking taxi from Jammu to Leh and return. Can we see places of tourist interest enroute as war memorial at Drass,magnetic hill, Lamayuru,Mulbek,Pathar sahib, etc. as outside taxi is not allowed in Ladakh. Hello Mr. Verma – Non local taxi is not allowed for sightseeing in Ladakh but all these places are on the way so yes, you will be allowed to visit them all.